Tom Ford Eyeshadow Quad in Cocoa Mirage - a little pop of coral. The Tom Ford Eyeshadow Palette is a product I have had on my wish list for forever. I have dreamt of its buttery formula, easy to blend shades and sheer luxe packaging for a while now, and this Christmas I was lucky enough to receive the quad that I most coveted, Cocoa Mirage. 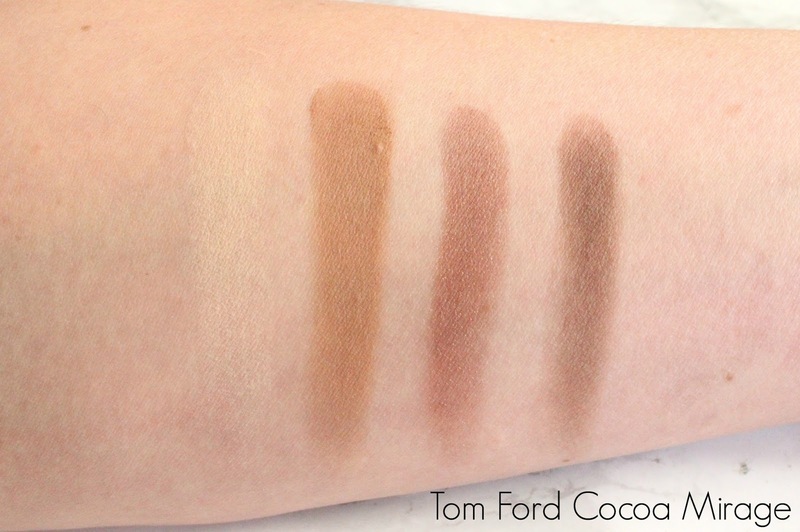 Cocoa Mirage is one of Tom Ford’s less shimmery palettes, which is why it appealed to me, as I am really loving matte shadows at the moment. At first glance, this palette doesn’t look that special, but it is the absolutely amazing pigmentation and buttery smooth texture that make these shadows like nothing else, I am blown away by how beautiful they are to apply and blend, they really are quite something! Cocoa Mirage is a collection of neutral, yet so beautiful shades, there is a matte vanilla, a matte beige/tan, a warm, slightly shimmery chocolate brown and a darker matte brown. I love creating a brown smokey eye using all the shadows, I wear the vanilla shade as a wash all over my lids and then run the tan shade through the crease. These two alone give a beautifully contoured everyday look, but the magic really happens when you add the star of the show, the chocolate brown shade to the outer corner. This shade is amazing, it has gorgeous red undertones to it, with a slight shimmer that just makes my green eyes pop and transforms the look. To complete the smokey eye, I take the darkest shade on a fine smudger brush and run it across both the upper and lower lash lines for extra definition. Blending is effortless with this palette, and I find it so easy to create both an everyday look and smokey eye with just these four shades. As you may gather, I am totally obsessed with this palette, yes it is expensive, but honestly if you only buy one neutral brown eyeshadow palette, make it this one, you will not be disappointed! Unfortunately though, it may get you hooked on wanting more, the new Tom Ford Eyeshadow Quads that have recently been released for Spring are just gorgeous! Have you tried Tom Ford Eyeshadows?